How to make RSA that works with bigger p and q value? When the value exceeds that, it fails. I want to make p and q bigger than that numbers. Is there something wrong with my code that causes it only to works or successful when it is only p and q is less than 200. What seems to be the problem here? Thanks in advance. 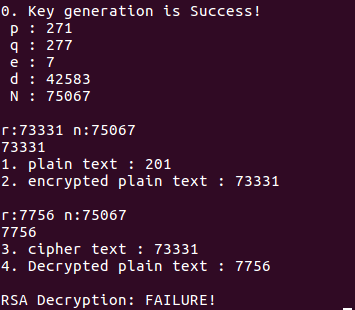 The failure here is that when the encrypted value does not return to the value of plaintext when decrypted. On your system uint is a 32-bit unsigned type. If p and q are greater than 255 (28-1) then n = p*q is greater than or equal to 216. That means that the intermediate calculation r*r may end up greater than 232 - 1 in the line r = (r*r)%n;. Unsigned integer overflow is silent and only the low-order 32-bits (for a 32-bit unsigned type) will be retained, which loses information and will result in an incorrect answer. A similar problem occurs in the line r = (r*base)%n;. This works because the intermediate arithmetic is carried out with 64-bit arithmetic, and since we know the result is less than 232 the final (uint) cast result in no loss of information. Email codedump link for How to make RSA that works with bigger p and q value?